"This recipe is easy to make but looks very gourmet. If you want a fancy grilling recipe, try it out." Rub the papaya slices evenly with 2 teaspoons olive oil. Cook the papaya on the preheated grill until hot and softened, about 10 minutes. Blend the grilled papaya, garlic, and butter in a blender until smooth. Pour into a small container and cool in refrigerator 1 to 2 hours. Again preheat outdoor grill for medium heat and lightly oil the grate. Rub the porterhouse steaks thoroughly with the 2 tablespoons olive oil. 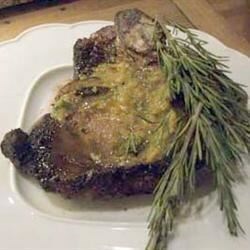 Stir the rosemary, salt, pepper, and garlic salt together in a bowl; rub evenly onto both sides of the steaks. Cook the steaks until they are beginning to firm, and are hot and slightly pink in the center, about 8 minutes per side. An instant-read thermometer inserted into the center should read 140 degrees F (60 degrees C). Top with the papaya butter to serve. My wife liked it but my son did not. He discovered he doesn't like papaya.